Win your set of 4 steel wheels banded free, all we ask you to do is share and subscribe to our Youtube channel to get us to 1000 subs, we only need another 600!! please share on any social media platforms with links to our channel. Once we reach 1000 subscribers we will post a video with details of the giveaway and ask you to leave a comment in the video comments, we will then assign each entrant a number and use a random number generator to pick the winner. 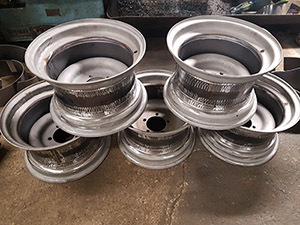 For the winner to claim their prize we ask them to send us four straight, good condition steel wheels, up to a maximum size of 19" diameter and we will band one band per wheel outwards dish to a maximum of 10" in width and to a total value of £220 standard banding price. The wheels will be blasted at our cost (normally £60) but primer and colour finish is up to the winner to have done. The wheels will be pressure tested before being returned. The courier cost is down to the winner, we can arrange the return courier but we will require the winner to pay this cost. Uk courier delivery is approx £30, overseas costs will vary, please check you are happy with courier costs before entering. We will announce the winner on this page and on our social media once the winner has been declared and notified. We will film the wheels being banded for our channel so you can see the process.